The Wilson(R) is a premier name in golf. And the Wilson(R) Carry Golf Bag holds with that tradition. Embroidery (Standard) Side Pouch: 4-1/2"w x 4-1/2"h, 5 color(s) max Standard Lead Time: 21 Business days. 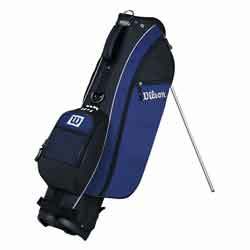 * Price includes a 1 to 5 color, 1 location embroidery on bag.